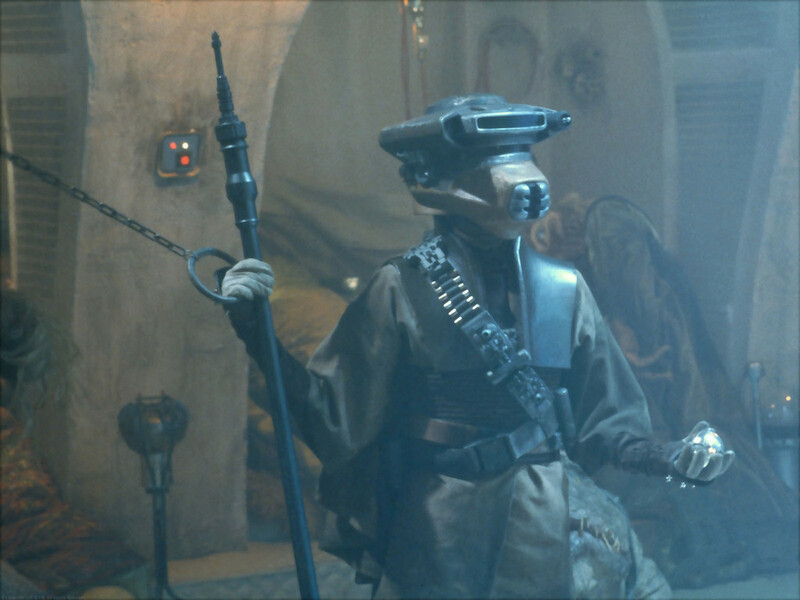 Princess Leia (disguised as Boushh) held a thermal detonator. 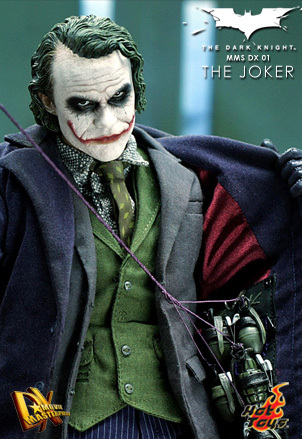 The Joker kept his thumb connected to a string of grenades. Julian Assange’s insurance policy? A pile of dirty secrets. In 2006, Julian Assange founded Wikileaks as a technological means to embolden the world’s people. Regime change, claimed Assange, could be fostered by releasing classified information to the public. Once an unjust organization’s inner workings get exposed, they lose the upper-hand and become vulnerable to being replaced by others who will promote a more open government. While Assange and his fellow freedom fighters have yet to directly overthrow a dictatorship, they certainly haven’t shied away from repeatedly stomping on increasingly powerful toes. Earlier this year, they posted a classified US military video showing children, journalists and other Iraqi civilians being gunned down in an unprovoked attack. A few months later came war logs from Afghanistan, followed by war logs from Iraq. Yet all of these leaks were trumped when Assange and his troop of truth-bringers began publishing 250,000 classified US cables, of which they’ve released less than 2000 to date. It is no small wonder that Wikileaks’ head honcho has been doing his best to safeguard his own life. This summer, part of this policy was put in place when a mysterious encrypted file appeared on the Wikileaks’ page for “insurance”. Were anything to happen to Assange or Wikileaks, the password for this massive file would be released letting the world gain access to all the skeletons held within. Until a cracker figures out how to beat the encryption scheme or the password gets leaked, the exact contents of this insurance file will remain known only to Assange and his inner circle. The rest of us can only speculate. Maybe this archive contains damning data pertaining to one of the targets Assange has already painted: The State of Israel or the Bank of America. Perhaps it deals with those alluded to yesterday by Wikileaks’ fearless leader, namely, CIA agents who’ve been colluding with Arab leaders. The file might even be a bluff, containing no intrinsic value other than the fear it inspires in those with secrets to hide. Whatever insurance policies Wikileaks decides to take out, hopefully they’ll be enough to keep one of the world’s greatest threats to tyranny – Julian Assange. – alive for long enough to see the fruits of the social revolution he’s helping to create. The end of institutionalized armed conflict – world peace – will arise when enough people come to recognize war for what it is: a trillion dollar industry that profits by perpetuating the worst parts of humanity. It won’t be long until we reach a tipping point and a critical percentage of the world is willing to stand against war. With the speed of internet adoption and the explosion of social networking, we could have the necessary influence required to counterbalance the behemoth military industrial complex within just a few years. A social revolution is already underway. 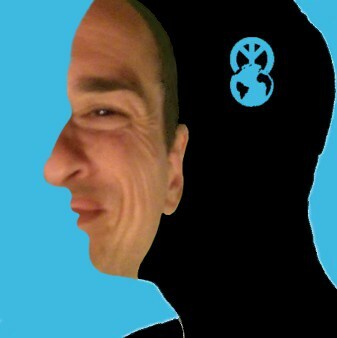 Online communities grow stronger by the minute and the collective human consciousness is becoming increasingly aligned. With the powers we are unleashing, amazing treasures – like creating a peaceful planet – are soon to be unlocked. The change we’ve been waiting for is happening now. Woohoo! What an awesome time to be alive! The New York Times has an interesting op-ed piece about America’s incessant war spending. As columnist Nicholas Kristof shows, most departments in the US are facing budget cuts while the behemoth war industry gets to enjoy an increase in spending. This highlights the growing power of the Military Industrial Complex. Even though regular American’s are seeing tough times and the US economy is struggling to compete with the rest of the world, the collusion between media, government, and the war industry lets them allocate a bigger slice of a dwindling pie to squander on war. It can be so frustrating to see this trend continue, knowing all of the positive and constructive uses that could have been done with these precious resources. Had America been investing these trillions of dollars into their own country, the population would now be better education and more secure – both factors which would make the US less inclined to attack other nations. And if American foreign policy didn’t involve a highly militarized approach, perhaps the US would have less reasons to go to war today. Radical extremists are born and bred within the cesspool of poverty and chaos. Bombs, guns and occupying soldiers do little to drain this cesspool. Most often the conditions surrounding war-zones will just compound the problem, creating new generations of extremists. A more productive approach would be to fund programs that are proving effective in the battle against extremism. Namely, those which improve socio-economic conditions and strengthen a country’s own communities from within. The War Machine has been running amok for too long. Without a counterbalancing force, the military industrial complex will only grow in might, using its ever expanding influence to manufacture and perpetuate more wars around the world. Awesome news: Wikileaks plans to release 4000 secret Israeli documents within the next 6 months! Reiterating what we covered in yesterday’s post, people who reveal abuses by governments and other powerful groups are helping to create a more just civilization. Considering how Israel has consistently violated international law and human rights for decades, these leaks are sure to help ease the plight of the Palestinian people. As more embarrassing and damning information comes to light, the true face of Israeli Apartheid will be laid bare for the world to see. Then, paralleling the world’s struggle against Apartheid in South Africa, global political pressures will mount until these Israeli injustices ultimately cease. Viva Palestina! In other whistle-blowing news, Wikileaks’s entire stash of cables has been leaked in Norway. To date, Wikileaks has only ‘slow-leaked’ a few thousand of the cables. Now, perhaps, the flood gates will be entirely opened. We should be crowdsourcing these piles of classified documents. Open them all to the public, allow discussions and ratings for every one. Let the masses filter out the most relevant information faster and more effectively than the handful of individuals doing it now. While such a move might be irresponsible for journalists to undertake, it would be a great thing for transparency and freedom of information. Power to the people! Courage is contagious. When individuals stand up for what they feel is right, their actions will inspire others to do the same. People who reveal abuses by governments and other powerful groups are helping to create a more just civilization. The struggle towards open governance is an important part in holding authorities accountable to the public they serve. Fortunately these words can go back on the shelf, for now. The FCC, by a 3-2 vote, passed an Order today which includes some semblance of ensuring Internet freedom. The FCC’s latest attempt at net neutrality, however, is far from what open Internet advocates would deem adequate protection. SavetheInternet calls the ruling “toothless“, PublicKnowledge voiced their disappointment over the FCC’s failure to stand up for consumers, and DSLreports points out how the FCC’s rules were heavily influenced by AT&T. While the FCC’s year-long efforts do little to ensure net neutrality, they’ve at least recognized the growing number of voices advocating an open Internet. Hopefully, as more people come to recognize the importance of an unrestricted online realm, the FCC (and other Internet regulatory bodies) will cater more to what the public demands. The human race is currently undergoing a social revolution on the global scale, and the Internet is playing a vital role in this great awakening. But the great potentials that await us could vanish should the specter of totalitarianism be allowed to descend on our precious Internet. So keep fighting for Internet freedom – it’s a cornerstone in the fight for a free human race. Edutainment at its best – here’s a short video about one of the world’s most useful plants: hemp! Industrial hemp can be made into oil, cement, wood, paper, plastic, textiles, and a highly nutritious food. The only reason hemp isn’t a trillion dollar industry today is because of drug prohibition. Hemp and all the wonderful products it can make remain another casualty in the draconian war on drugs. Bradley Manning – the US Soldier responsible for leaking over 250,000 classified documents to the whistle-blower site Wikileaks – has been the unsung hero of the entire CableGate fiasco. Wikileaks founder Julian Assange has been at the center of the international spotlight, while Manning’s plight has remained mostly forgotten. Even here, on this blog, not one of the many Wikileaks posts even mentioned Manning’s name, until now. Fortunately, it seems that support for the brave soldier is on the rise. News of Manning’s tortuous conditions, like being placed in solitary confinement without blankets or pillows, has been making headlines. The public is becoming increasingly aware of how the US authorities are using these inhumane tactics to pressure Manning into providing testimony against Assange, to which Manning has not yet complied. Hopefully he will keep holding strong as the world comes together to lend support. Visit http://www.bradleymanning.org/ to learn more. 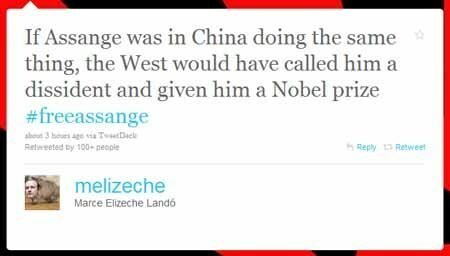 Marce Elizeche Lando posted the tweet below about Assange, which is just as applicable (if not more) to Bradley Manning.